The correction is becoming deeper; at the H4 chart, the market has already reached the level of 23.6%. This sideways movement may yet continue for a while, but later the pair is expected to start a new ascending movement towards the upper target levels. At the H1 chart, the target reached one of the temporary targets, which means that the correction may finish. Right now, the price is trying to start a new ascending movement. During a short pullback, I opened a new buy order. There is a possibility that the pair may break the maximum before the end of the week. Franc also started a deeper correction; the market has already reached the level of 38.2%. If the pair rebounds from this level, the price will start a new descending movement. However, I’m staying out of the market right now and have only a pending order. At the H1 chart, Franc rebounded from the level of 38.2% inside one of the temporary fibo-zones. We may assume that right now the price is making a reverse downwards. 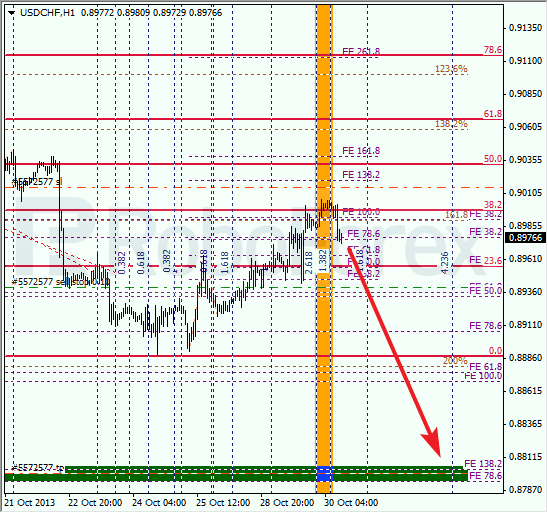 The main target is still at the level of 78.6% (extension).